IMAP stores all email and folders on the server, which is perfect for accessing messages with a desktop client (say, Outlook on a laptop) from multiple locations, and having centralized backup. Mailtraq's IMAP email server provides a powerful email solution and with Push-email support giving 'instant' delivery of email to mobile devices it is ideal for roaming users. Each IMAP email server mailbox may have any number of sub-folders within it, and users can configure these using a standard IMAP client. The IMAP email server is provided in Mailtraq Professional editions and can easily be added to the basic services that Mailtraq provides at start up. See IMAP server video. 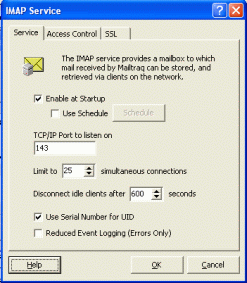 Mailtraq's IMAP email server is standards-compliant to IMAP4, so all the popular IMAP clients such as Outlook Express, MS Outlook, and Mozilla Thunderbird can be used. Smartphone users, such as the iPhone or Android can easily use their standard IMAP4 clients with Mailtraq. Mailtraq's IMAP email server supports IDLE and so will provide immediate delivery of messages to suitable clients. This is particularly of interest to users of mobile devices with push-enabled clients. The IMAP email server provides immediate notification by use of the IDLE command protocol extension. Mailtraq's IMAP email server implementation also supports shared 'public folders' and mailbox sharing in Outlook, Thunderbird etc., allowing either read-only or read-write access. Getting started is a simple as creating a new email account and setting it to be IMAP. You then tell the email client that the IMAP email server and the SMTP server are at the IP address of the Mailtraq machine. Your login information is the Username and Password for your Mailtraq mailbox. If you need to migrate from another mail server to Mailtraq and keep your existing mail and folders - use IMAP to make an IMAP connection to Mailtraq and to your old server, then use the client to 'drag' folders from one to the other, or use the import tools provided.